In many cosmetic dentistry makeovers either porcelain veneers or porcelain crowns are the restoration of choice. Typically, dental crowns encase an entire tooth whereas porcelain veneers cover only the front side of the tooth. The amount of tooth reduction needed for a crown differs from that of a veneer. Aside from removal of decayed old fillings there are structural requirements which can sometimes dictate the need for a crown over a veneer. In cosmetic cases keep in mind there is some idealized surface shape that the dentist is trying to achieve for both cosmetic and functional concerns. A classic porcelain veneer is a wafer-thin shell of ceramic that is bonded onto the front of the tooth. Whereas a dental crown covers and encases the entire tooth, a porcelain veneer just covers the side of the tooth a person shows when they are smiling. 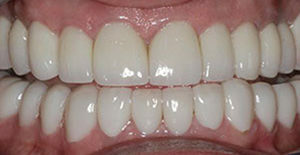 There is significantly less tooth structure removed for a porcelain veneer as opposed to when a dental crown is made. 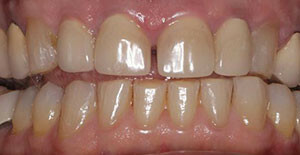 The veneer is a preferred preparation in that less tooth structure is sacrificed.